Hello lovelies! I have a fun post to share with y'all today. It is a review on the POPSUGAR Must Have Box, which is a monthly subscription box, but instead of focusing on just beauty products they also feature home stuff, food, fashion, and they do feature beauty products too. Recently I was contacted by POPSUGAR asking if I wanted to review their subscription box, and as you can see I said, yes!! I have been eying this subscription site ever since they first launched two years ago -- just don't have the money to subscribe to them right now. Anyhow, let me share with y'all what is in the August box & my short review on each product. Italics means it is taken from the POPSUGAR Must Have's August booklet. 1. Kendra Scott Elisa Necklace in Black Cat's Eye [$50] -- "Add some extra shimmer to your outfit with this pendant necklace perfect for everyday wear. The black oval stone and delicate chain make this piece an instant classic!" -- This necklace is very classy & chic and perfect for adding that little touch to any outfit. I will definitely be wearing this necklace a lot in the coming days/weeks/months. 2. Paddywax Ocean Tide + Sea Salt Mini Jar Candle [$10] -- "It's all about ambience -- that's why we're obsessed with this hand-poured candle. With fragrance notes of sea salt and the ocean tide, this soy-wax candle brings the beach to you." -- At first I was worried about liking this candle, since it is made out of soy-wax, which is something that I typically react to. No worries though! I tried out this candle last night, and I was able to enjoy every moment of the beach feeling this candle gives. 3. Goodbyn Purple Meal and Dipper Set [$8] -- "Keeping track of meal portioins in a portable way has never been easier, thanks to Goodbyn's container set. Dishwasher safe and versatile, this set is ideal for packing food on the go." -- Very practical, since everyone can always use another lunchbox type container in their kitchen. Will definitely be using this, since I like to pack a lunch to save money. 4. The Mason Jar Cookie Company Celebrate! [$12] -- "Make any celebration even more festive with your mason jar cookie mix. Just add butter and an egg to this pre-measured baking mix for a delicious treat." -- I'm actually softening the butter to try this kit out right now. Will update with how it goes, and if the cookies taste any good. To say the least, I have some tough cookie testers in our house -- we like our cookies to taste good and to be on the softer side -- so no crunchy cookies for us. Cookie Update: The cookies were amazing! My sisters, brother, and Dad all loved them! You can see a picture of how the cookies turned out on Instagram. 5. Lollia At Last Perfumed Shower Gel [$22] -- "At last, a shower gel that leaves you feeling clean and smelling simply amazing. Infused with shea butter and jojoba oil, this shower gel will keep your skin refreshed and smelling divine." -- The packaging is simply divine! Not sure on the scent or product yet, will update once I've tried it out. BTW, be sure to check out their website as it is adorable. 6. Bite Beauty Lush Fruit Lip in PopSugar [$22] -- "To celebrate POPSUGAR Must Have's second birthday, Bite Beauty created this new shade just for the occasion. With nourishing strawberry, coconut, and avocado oils, this gloss is a superfruit smoothie for your lips." -- I've been really loving BITE Beaty recently, so I'm super excited to have one of their glosses in my collection now. It is a nice bright pink, that isn't too in your face. It feels kinda goopy/sticky at first, so don't load up too much of this gloss on your lips -- apply a thin layer and you should be fine. Also, this gloss has a nice moisturizing feeling when wearing it. 7. thinkThin Brownie Crunch High Protein Bar [special extra in box] -- Excited to try this bar out, especially since it doesn't include any foods that I'm allergic too. Will update on how I like it. Special for y'all, you can save $10 on a 3-month subscription with the code: AUG14SELECT So if you have the money, feel free to use this code to help save you a little bit of money. Are you/would you sign up for POPSUGAR's Must Have box? 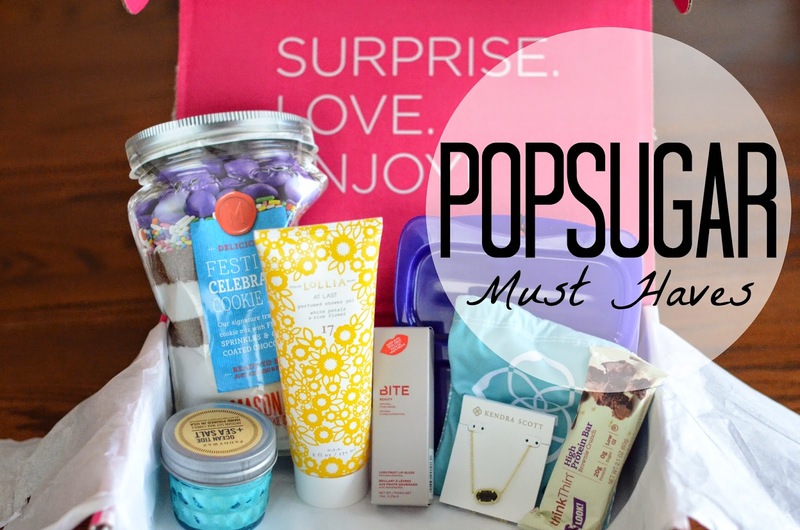 POPSUGAR provided me with a complimentary POPSUGAR Must Have box. The opinions I have shared about the box are m own and POPSUGAR did not tell me what to say or how to say it. this is a wonderful beauty box!! and I liked reading your reviews! That's really cool! I love that lip gloss! What kind of nail polish were you wearing in that video? It's so cute! P.S. Again, congrats on your new job! Thanks so much! I was wearing Essie's "Mint Candy Apple" -- is the perfect mint/blue. You're right, it is the perfect mint/blue color! I'll look for that one or a similar one next time I buy fingernail polish!